Swipe it-ready to beat the challenges and to make new ones? If you are recreational player then get prepare because an arcade game is recently developed to challenge your reflexes and skills. This time we brought you a game Swipe it. With varying levels of difficulties to spin up your mind and test your precisions. 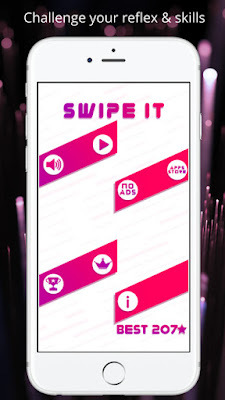 Swipe it is addictive color matcher that will give you unique way of color matching game play with extreme challenging levels to go through.it is a perfect blend of color matching and swipe matching games. You have to match the ball appearing in different colors on the screen and swipe it to match with colors appearing around the ball. Get a chance to avail the amazing features that are just one click away. It free to download for your iOS device. App Store Download Link: Swipe it.